ONLY 30,434 Miles! Nav System, Aluminum Wheels, RADIO: UCONNECT 430N CD/DVD/MP3/HDD/N... Brake Actuated Limited Slip Differential, Running Boards, 4x4, TRANSMISSION: 5-SPEED AUTOMATIC (W5A5... CONNECTIVITY GROUP. SEE MORE! TRANSMISSION: 5-SPEED AUTOMATIC (W5A580) Hill Descent Control, Tip Start, RADIO: UCONNECT 430N CD/DVD/MP3/HDD/NAV SIRIUSXM Travel Link, 6.5 Touch Screen Display, GPS Navigation, 40GB Hard Drive w/28GB Available, Remote USB Port, BLACK 3-PIECE HARD TOP If ordering without AEM (Dual Top Group), the black soft top will not be included, Rear Window Defroster, Delete Sunrider Soft Top, Freedom Panel Storage Bag, Rear Window Wiper/Washer, CONNECTIVITY GROUP Vehicle Information Center, Tire Pressure Monitoring Display, SUPPLEMENTAL FRONT SEAT SIDE AIR BAGS, ANTI-SPIN DIFFERENTIAL REAR AXLE, ENGINE: 3.6L V6 24V VVT (STD). 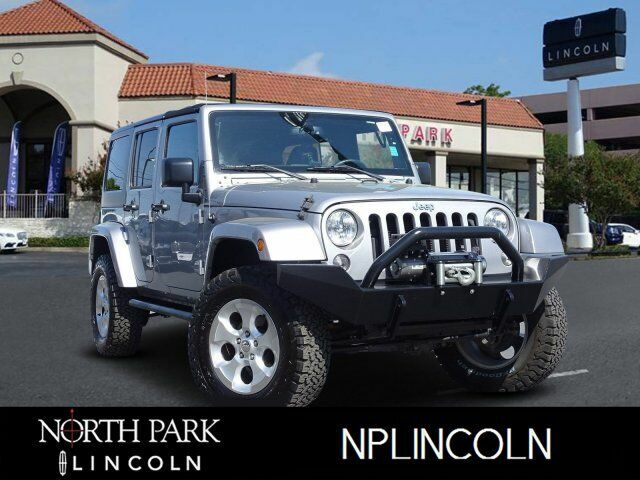 2015 Jeep Wrangler Unlimited with Billet Silver Metallic Clear Coat exterior and Black interior features a V6 Cylinder Engine with 285 HP at 6400 RPM*. CARFAX 1-Owner KBB.com`s review says There`s generous ground clearance, minimal overhangs, and that distinctive Jeep look, of course. Being equipped with 4-wheel drive, the Wrangler is nearly unstoppable off road..